BUTTERFLY and BERRY: Marigold sets are seen as frequently as any of the colors known, followed by blue. Green sets are considered rare and amethyst very rare. 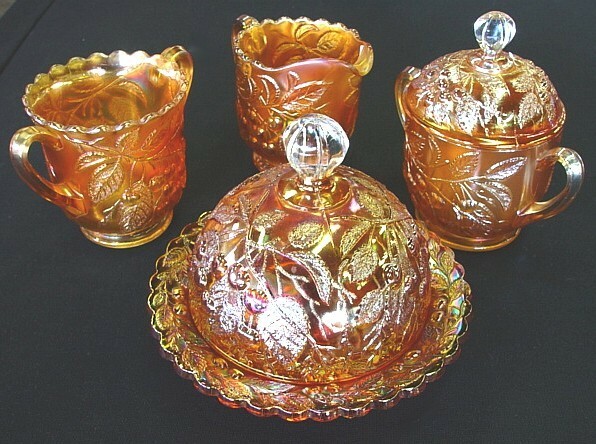 Butterfly and Berry pattern is known only in carnival glass and began appearing in marketing ads in 1913-1914. The 1927 Sears Roebuck Catalog ad confirms a very long run of acceptance from the buying public in the dozen or more shapes/ whimsey items found in the pattern today. Confirmed by Frank M. Fenton, company inventory records reveal listings for the pieces from 1910-1929. 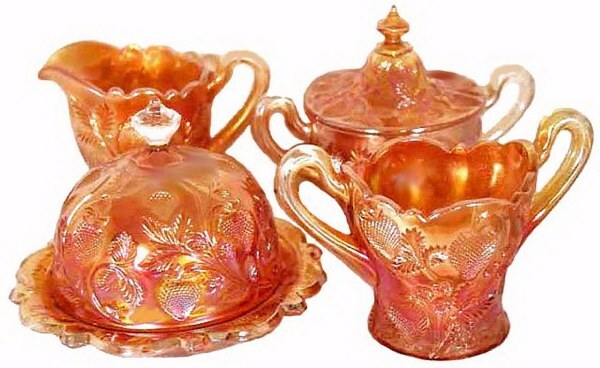 The Fenton Art Glass Company showed Butterfly and Berry pieces in their 1913-1914 colored catalogs. At that time only marigold and blue were being manufactured. 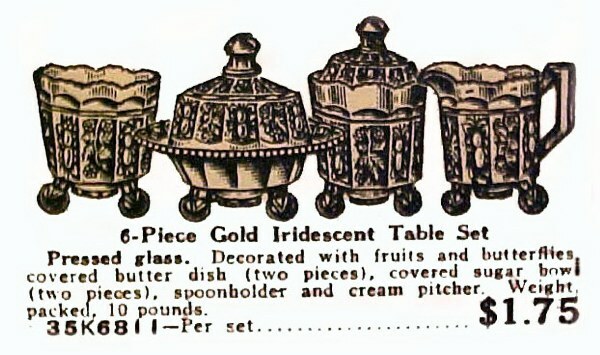 The Butterfly and Berry pattern appeared in the Mid Spring 1911 Butler Brothers Wholesale Catalog, listed as a dining set. INVERTED STRAWBERRY: To find a complete set in this pattern would be a “prize”. Most table set collectors put them together a piece at a time over long years of search, then find it necessary to “upgrade” a piece here and there to create “matching” sets. Inverted Strawberry is a Cambridge offering and with effort, sets can be made up in green and amethyst , in addition to marigold. Some portions of sets in blue are known. NOTE: At the time we visited the Museum, no complete sets were on display and the spooners were called “sugar”. You will find them indicated as such when viewing our Cambridge Part 4 segment. Curators make mistakes, just as the rest of us do. Vermont is full of wonderful museums. While viewing several of them on a trip during the early 80s, we discovered a carnival glass punch bowl sitting atop a base turned upside down. We waited for the curator to return from lunch to discuss the possibility of reversing that error, only to discover that so far as she knew, we were not “authorities” on the subject! We still laugh over that encounter! OCTAGON: This Imperial pattern is widely known and seen in at least 23 documented carnival shapes, having previously been made in a greater variety of non-iridized crystal offerings. Four piece table sets are quite scarce and underrated, even in marigold! Rare is the term to be used for helios and purple sets. The butter dish is known in a lovely aqua shade. GRAPE & CABLE: Vineland was the pattern name applied to these Northwood four piece sets when marketed in a 1910 Butler Brothers Catalog. Most often found in marigold and amethyst, green sets are somewhat harder to locate. Extremely rare ice blue sets exist. 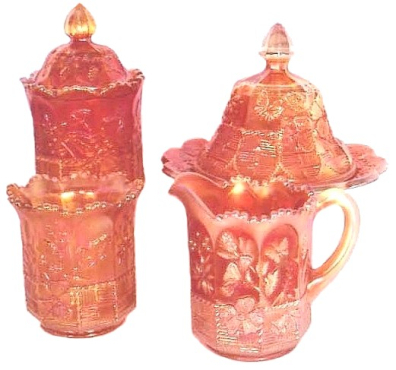 (Be aware of reproductions in this color-particularly the butter dish, which has a broadly scalloped base.) You can see that the OLD ones have a sawtooth - like edge. The ice green set seen here may possibly be the only one known. DAHLIA: This pattern dates from the 1912 period of Dugan carnival production, resulting in a mold re-tooling of the original Fan pattern. (Seen in a 1907 Dugan Catalog ad). 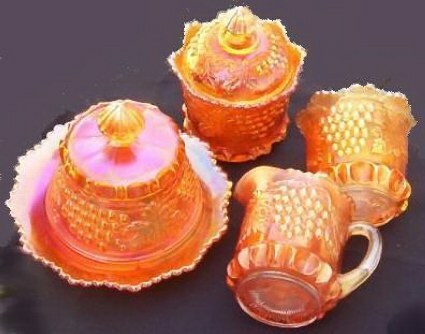 Very few of the Dahlia sets in any color pass through the conventional carnival glass auction. Dean photographed the marigold set prior to a Wroda sale, and the white set was included in a Reichel sale we attended. The pattern, overall, has never been given its due respect. Perhaps this is a result of its near-obscurity in certain of the shapes. Sets are difficult, and some collectors confine interests to bowls and plates, allowing for the “problem” of putting together berry, table and water sets. GRAPE & GOTHIC ARCHES: While this Northwood pattern was not produced in the wide range of shapes found in Grape and Cable, it certainly follows the popularity of Grapes as a motif for glass during the early 1900s. Circa 1909 -1910, Grape & Gothic Arches was apparently a successful seller. It enjoyed a production run of at least six years. 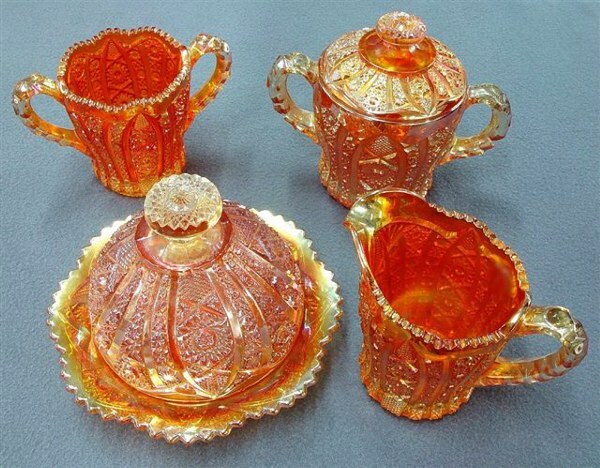 Moulds were used for custard glass production, as well, during 1914 -1915. 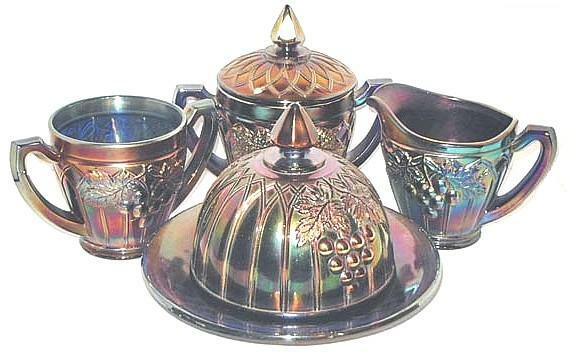 Examples in non-iridized crystal and emerald green were made throughout the 1909 -1915 period as well. 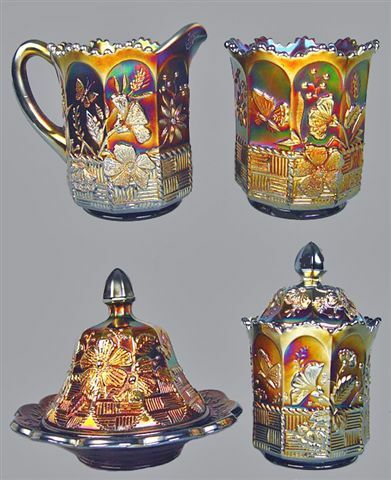 The custard examples have a light iridescent finish referred to as “pearlized custard.” These pieces are difficult to obtain, as are examples in iridized green. 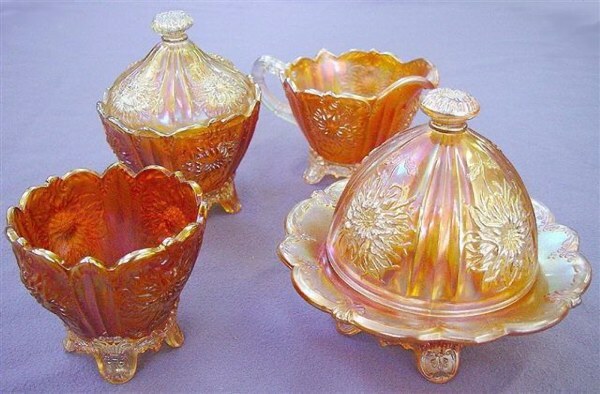 Amethyst and marigold sets are known, as well. HANGING CHERRIES: The account given in Marie McGee's Millersburg book states that this four piece table set is probably the easiest of all Millersburg table sets to locate in amethyst, green or marigold Carnival. A few pieces are known in blue. 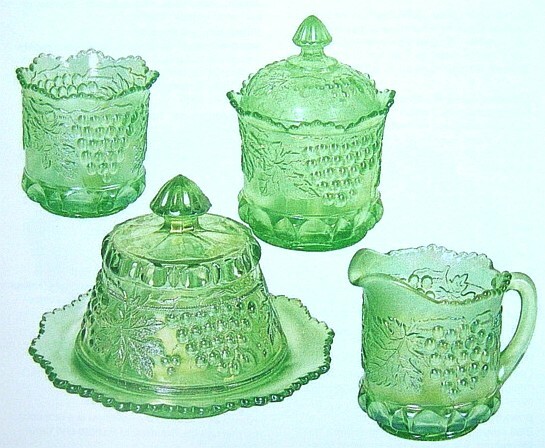 Two butter dishes with aqua bases and green lids have been seen. SPRINGTIME: Dating from the 1910 -1911 period of Northwood production, the pattern was used exclusively for iridescent ware. Not known in any other form of glassware, the production run must have been limited. Except for green water sets, very few other examples in this pattern are easily found today. Marigold, amethyst and green are the known colors. When Jesus called His disciples to follow Him, He meant that He would do the leading and directing; they would do the following (Luke 5:27). and choose to “lose” our lives for Him (17:33). You must first learn to follow Him, in order to lead others to Jesus.